Here are five games that can help you and your child with the learning journey and make it engaging and entertaining at the same time. Hurray! 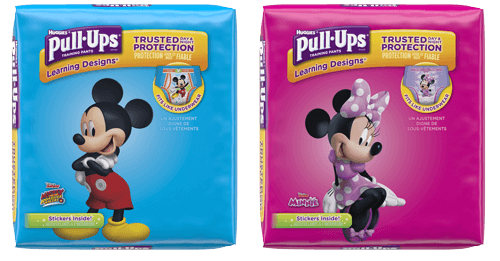 Your little one is ready to be potty trained. This means your child is growing up and becoming more independent, and they’re ready to start the major transition from passive baby to active toddler. This also means it’s time to ditch the diapers for good and switch to Pull-Ups® Training Pants. By ditching the diapers, you’re acknowledging potty training as an important achievement in your toddler’s development. Toddlers thrive on consistency, so this will help them practice and feel comfortable with their new skills. Make potty training more exciting for both you and your toddler by using some fun and easy potty training games. You and your child can do these together to help them stay engaged throughout the journey. Make it fun and tell your child it is an important step towards growing up and becoming a big kid. You are in this together! Build-A-Bathroom Puzzle: The bathroom might seem like a mysterious place to your child. Help solve this with a "build-a-bathroom" puzzle. Explore the bathroom and explain what each piece of equipment does and how it works, and then demonstrate. For example, explain how you wipe yourself with the toilet paper, how the toilet bowl fills with water when you flush and how you wash your hands with soap afterward. Verbally label each component of the bathroom to help your child’s language develop, so he can effectively communicate with you. Pull-Ups® Scavenger Hunt: If you want to add a little more fun to your potty training routine, try the Pull-Ups Scavenger Hunt. The game lets your youngster seek and find all of their potty training items. Place her potty training goodies around the room, including Pull-Ups® Training Pants, Pull-Ups® Big Kid* Flushable Wipes, a potty chair and a tablet or phone with the Time to Potty app open. Afterwards, have a discussion about each of the items that your child finds and how it will help him learn to use the potty. Potty Time Sequence Cards: Help teach your child the sequence of events leading up to using the potty by detailing each step of using the potty. After you’ve identified the parts of the bathroom, download the flash cards with words and pictures so you can continue the conversation in and out of the bathroom. Play a game of “What do we do first? Next?” Have your child put the cards in the correct order and then demonstrate the process. You can also play a labeling game, asking, “What’s this? What do we do with it?” Discuss how part of potty training is knowing your body and how it feels when you have to go. Talk about what to do when you have that feeling. Potty Training Race: The Potty Training Race game is a fun and easy way to teach your child how to use the potty. It also gives your child a cue for when really needs to go. Place a potty chair somewhere in the room and explain: “When I say ‘Time to potty’ you and I race to the potty and see who can sit down on it first. Whoever is there first wins." Play this game in every room in the house. To make it more challenging, hide the potty chair so your child has to find it. Set a timer and encourage your child to beat his time. Have your child practice sliding down their Pull-Ups before sitting on the potty and make the winning action peeing or pooping into the potty. Sticker chart: Celebrate successes…even small ones. Help your child show off their potty training achievements by creating a chart that hangs at their eye level in the bathroom. Let her choose stickers to add to the chart each time she reaches a goal. Say things like, “Each time you use the potty like a big kid, you can put a sticker on your chart. Let’s see how many stickers we can put on the chart today!” Keep in mind that toddlers don’t have a solid sense of time yet, so stickers are most effective when used as an immediate positive reinforcement rather than as a goal to save up for later.